Brewed at Boon Rawd's Khon Kaen Brewery. 4.7% alcohol. 25 baht for a large bottle. Tastes fine to me, but I like any beverage that contains ethanol. Is it cheaper than Leo up there? When did it come out? I've not seen it. My wife says she's heard of it but hasn't seen it either. Cheaper than Chang ... I'll bet it's putrid. ^I actually liked it and will buy more. I had heard about it, but hadn't seen it until I wandered into the place I usually buy Scotch. To me it tastes a bit like Leo. Less sweet than Singha. Lacks the metallic alcohol flavor of Chang. I had 3 bottles the other night and they were okay. Same price, 25B a bottle. I usually drink Archa but may switch after a few more tasting sessions. Purely for scientific reasons. Where can I get the Homer Simpson bottle opener? My mates got one and I try and steal it every time I go round! My Dad sent that to me. When you open a bottle the voice of Homer sounds off something like "Ah, beer...." It's all very amusing. It stopped working once and I liked it so much that I went inside and re-soldered a wire that had come lose! 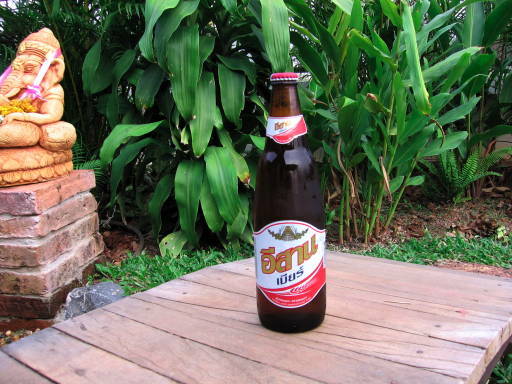 After an absence from the market of nearly a month, Isaan Beer is back. And, billboards are appearing here and there. The price is up: 105 baht for four large bottles. I've yet to see it. Bloody bargain. My doctor is trying to talk me into drinking lite beer ... I must give it a try. Tried it last night for 1st Time and have to say its the best of the low priced beers by a long shot, only tried on e bottle so bit early to tell but pefer it to Leo at this stage. 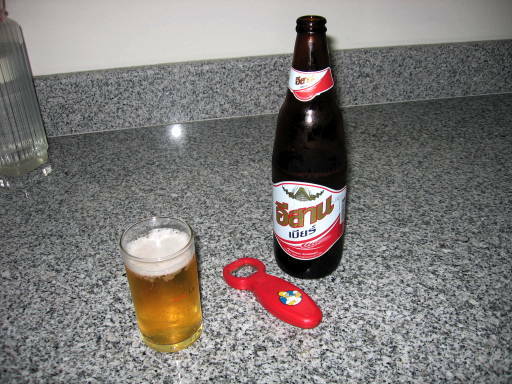 Tried it a few weeks ago, not sure what it tastes like though as had consumed half litre of Sangsom proir to that. 100 Baht for 4 bottles round here in Khon Kaen. Cant knock it! ^Indeed. For the price, you can't beat it. I just hope they keep up distribution. its quite difficult to purchase, tried on the weekend, no one has. Still no trace of it in Roiet. Will try again in a couple of days. They must be ramping up production as I brought a carton of it yesterday, Propagator is on his way around now so we shall sample and test it from an Englishmans point of veiw. I bet its an improvement over the rubbish he has been drinking at home in the UK. I said don't be silly Prop, its got way too much alcohol in it for the delicate sensitivities of the people in a country raised on weak, warm piss, so we think a watered down version may work. Never seen that one, but i quite like Leo. Chang i can drink just fine but i get one hell of a hangover with it, i think it gives me mental health problems. I heard that Heineken is 5&#37; in the UK now. Shocker!